Some of the problems which make this a very poor movie, from the point of view of a T’ai Chi teacher, a scholar of Chinese thought and a fan of martial arts movies. The problem for any cinematic depiction of martial arts is that in order to look dramatic and exciting for the audience, realism is compromised. Experienced fighters and actors such as Bruce Lee and Dan Inosanto recognized this 50 years ago, and made a clear distinction between realistic martial arts and their dramatic, stylized representation on the screen. Real Wing Chun Kung Fu or Jeet Kune Do, as taught by Lee and Inosanto, would look very boring on screen and would be barely discernible, because the object of these combat martial arts is to end fights quickly and efficiently. Of course, Lee and Inosanto knew how to choreograph a fight scene and keep an audience engaged. They never claimed to be accurately depicting real fights on screen. They knew the difference between performance in martial movies and real fighting. Dan Inosanto spoke with me at length in 1998 about his and Bruce Lee’s position on these issues. I interviewed him in Los Angeles in the course of the BBC World Service series, SHADOW BOXING IN THE PATH TO NIRVANA. The problem is even more acute in the representation of T’ai Chi Ch’uan, because the objective of T’ai chi as a martial art is to be natural and spontaneous, using minimal effort and avoiding flourishes or large, obvious movements. So the more effective it is as a fighting art, the less obvious it looks. Some of my teachers used to say that if you use your T’ai chi in a fight, everything you do should look accidental, and you should hardly be aware of what you have used in terms of technique. You just respond spontaneously. Inevitably the movie representations of T’ai chi and other martial arts look anything but natural and are highly stylized and dramatic, partly to excite the audience and partly to inform them which art is being demonstrated. In reality, to modify a Taoist verse from the Tao Te Ching (Ch 38), the real Man of T’ai Chi, doesn’t look like he knows T’ai chi, that is why he has excellent T’ai chi. To give a concrete example: Tiger Chen, and even his master, use some high kicks in their fights. T’ai chi does not employ high kicks; they are too unstable and expose the kicker to a counter. All combat T’ai chi kicks are low and are almost never used free standing. In other words, you kick low and only when you already have control of your opponent’s arm or arms. But this in execution is not dramatic and looks somehow unfair. Of course, it is unfair, it’s a fight. Critics of this claim might object that there are fairly high kicks in the form, and they are all freestanding. Yes, but form is form and fighting is something else. The basic t’ai chi forms are done solo, so of course the kicks are free standing. Some kicks may look high in a showy performance of t’ai chi, but that is because they are not connecting with anything. When they connect to an attacker’s shin, knee or groin, the energy of the follow through is driven into the target and the kick is low. Martial artists, who enjoy martial arts movies, tend to be aware of many of the above considerations, but they watch martial arts movies for the style and performance, not as guides on how to fight. Just as a serious ice hockey player may enjoy watching figure skating or ice dance shows, but he/she is not learning about hockey in the process, she/he is admiring the skill and precision of the technical performance. 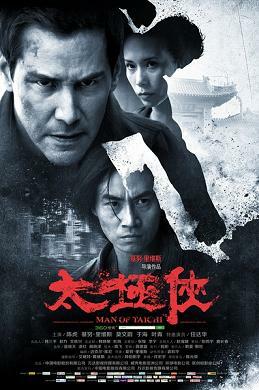 Having made these points, I shall now make my review type comments about MAN OF T’AI CHI as a martial arts movie, not as a demonstration of real T’ai chi. As a movie it is quite pedestrian. The plot is simplistic. It is basically a tournament movie, owing much to previous examples of the genre, including ENTER THE DRAGON and the original KARATE KID 1 & 2 movies, but with elements of THE TRUMAN SHOW & even HUNGER GAMES thrown in. The story is that Tiger Chen, a skilful T’ai chi student who trains at his master’s temple in Beijing and works as a courier, enters a few tournaments and does well. An evil martial arts entrepreneur Donaka Mark (Keanu Reeves) sees his progress and tries to recruit him for his illegal, no holds barred tournaments that are filmed for exclusive clients, who pay well to see these fights to the death. At first Chen refuses, but Donaka manipulates events so that the Master Yu’s temple is served with a demolition notice. Chen needs money to fight the eviction and planning process, so agrees to fight. He wins several fights without realizing they are being filmed and that he is being groomed for death matches. His master sees the changes in Chen and tries to warn him to stop the fights and to continue his training, meditation and ch’i cultivation, but Chen is drawn into this evil underworld and becomes more remote from his master. This leads to a showdown fight between master and student, and Chen being hurt, as well as confused about his identity and values. It soon emerges that Donaka’s fights to the death entertainment channel is only itself a front for his real demonic agenda which is to bring about the ruin of an honest, decent T’ai chi student and his surrender to the dark side, and to film the entire process on secret cameras, as in THE TRUMAN SHOW & HUNGER GAMES, and other reality TV spinoffs. I shall not spoil the movie for readers, by giving away how this good versus evil conflict plays out. Just as in ENTER THE DRAGON, a showdown between the evil manipulator and the heroic martial arts student, is inevitable. I would say that Bruce Lee’s fight with the evil Mr Han in ENTER THE DRAGON completely outclasses the fight between Chen & Reeves, in every respect, including the fight choreography, the way it is set up dramatically, the narrative justification, intensity of the action, and the acting of the main characters. I risk sounding ‘old school’, but I am tempted to say that it is all s**t since Bruce Lee died. Bearing in mind that ENTER THE DRAGON was made over 40 years ago, and Bruce died shortly after its completion, then the genre seems to have regressed rather than developed. Dan Inosanto seemed to lose interest in martial arts movie making after Bruce Lee’s death, and focused on his career as a martial arts teacher. Reeves depiction of the evil Donaka is low-key and almost deadpan, and both he and Chen seem to lack any screen presence or charisma. It made me realize just how much the first MATRIX movie owed to an excellent script and top class, if highly stylized, martial arts choreography. Reeves performance there as the geeky Mr Anderson who slowly discovers the existence of the Matrix, and learns martial arts intensively in a virtual training program, far outshone his delivery in MAN OF T’AI CHI. Tiger Chen is clearly a proficient martial arts performer and stylist, but his performance as an actor was tepid, and he seems to have been given little guidance by his director and friend Keanu Reeves. MAN OF T’AI CHI in its attempt at Taoist profundity falls way short. By trying to equate the struggle between the Good Master Yu and Evil Donaka, with the relationship between yin & yang in T’ai chi philosophy, it completely misses the point that relationship between yin & yang is mutually supportive; they are not absolutes of good or evil, but states of interdependence. This is clearly explained in my book ‘T’ai Chi Ch’uan – Wisdom in Action’. Yin and Yang function as mutually supportive relational qualities, in T’ai Chi, as in Taoism. In fact neither Taoism nor T’ai chi philosophy accept ethical or cosmic dualism. This is also the point of chapter 38 of the Tao Te Ching, which I referred to earlier. If a screenwriter, or his director, are going to cite philosophical concepts underlying T’ai chi ch’uan and Taoism in a movie, it is better that they understand them properly first. I am afraid this movie is a disappointment and a missed opportunity to develop the genre. Even the set designs are unoriginal, and the terrible shiny suits worn by Keanu Reeves make the film look more like ‘MAN AT C&A’ than ‘MAN OF T’AI CHI’. I am not really surprised that no general release in the UK or USA seems to be scheduled.